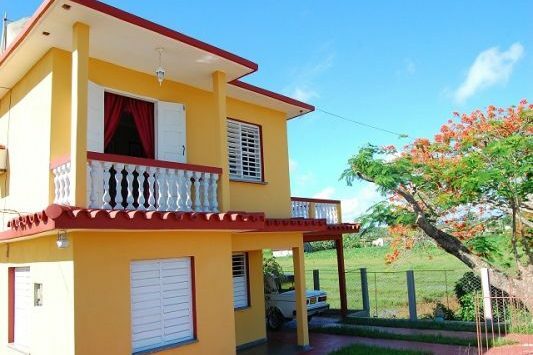 Casa Sunny Balcony House - Balcon Soleado in Viñales is a new home. 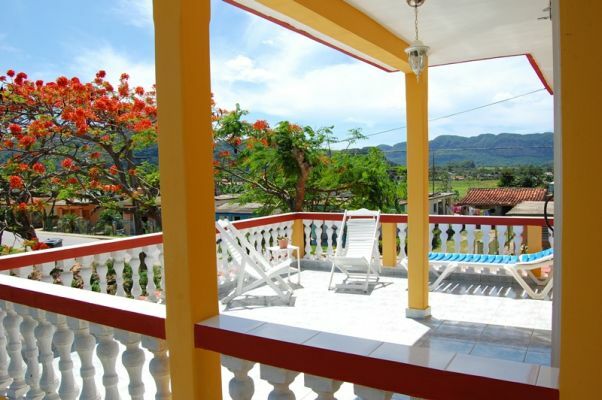 They rented a whole second floor for clients, the rooms have private bathrooms, two balconies with panoramic view, where you can observe the drying process of tobacco plantations, also the mountain views that surround our valley. 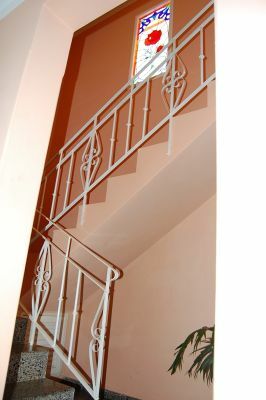 Also on the second floor they have a dining room and guests can have dinner while enjoy the amazing views from balconies. Owners are a young couple with a child of 4 years old. They both have experience with tourism and speak english. Casa owners don’t accept clients coming with driver or guide. Street Salvador Cisneros #34 / Arroyo el Duelo & Street B1, Vinales. Very nice casa with a nice view from the balcony. only a short walk from center, but a quit location. Very sweet and helpful hostess who speaks good English. She arranged a nice tour by horse car for us. Breakfast was delicious and good. Está casa en Viñales, donde pasamos 3 noches, es maravillosa. La habitación espaciosa con un balcón enorme privado y otro balcón común donde comes unos desayunos bien ricos. Los dueños son encantadores y te ayudan con todo. Nosotras tuvimos un problema al llegar al pueblo que se encargaron de solucionar sin pedir nada a cambio. Organizan excursiones, te reservan en restaurante, te indican todo lo que puedes hacer en el pueblo y alrededores. La verdad es que unos anfitriones de 10 a los que no podemos más que darles las gracias una y mil veces. 100% recomendable. We enjoyed the stay very much. The owners are very helpful and friendly. In a minute the tour with a horse carrige was arranged for us and also the taxi collectivo to our next destination. The owners can speak English very well and so it was a great experience to chat about Kuba. We loved seeing the mongotes from the balcony along with the delicious breakfast. Almost opposite the street we had a fantastique cuban dinner with a great view on the mongotes. The center is within 5 minutes reach and so it is both quiet and convienent to stay. We would stay there again! 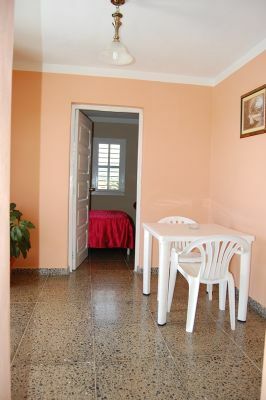 Great location a short walk from central Vinales. The balconies had a beautiful view of farmland, the street outside, and the mountains themselves. Kirenia was very friendly and helpful with welcoming me with coffee, organising tours, and arranging a laundry service. How was the food? : I didn't eat much as I was sick (from another location) but the food looked like an amazing Cuban breakfast - eggs, bread, cheese, fruit, even crepes served with delicious juice and coffee. How was the room? : Very comfortable with its own private balcony and a great view. Other Comments: A very pleasant stay. Really lovely owners and a comfortable room on the private upstairs floor of the house. 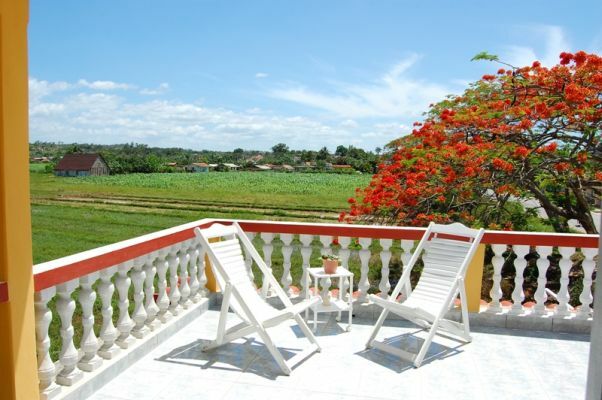 The balcony is large and sunny , giving great views on town life and the surrounding mogotes. Upon our arrival, they organized a walking tour for the next day, to the Valle de Silencio, which was the highlight of our visit. Would definitely stay here again! How was the food? Great breakfast! How was the room? 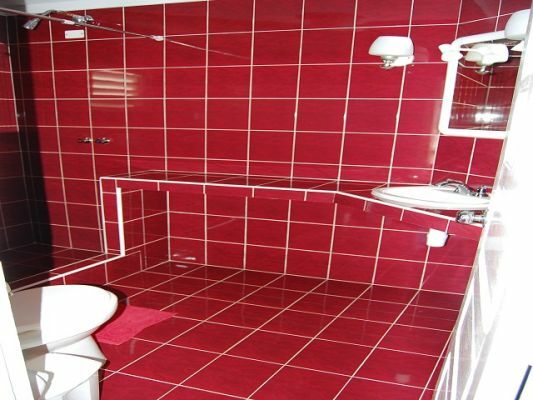 Clean and roomy, nice bathroom.